We were using Young Living’s products for close to a combined decade before we opened our hearts and minds to the business opportunity with Young Living. And like most Young Living members who pursue building a business, we got here by accident. See, the thing is, when you start seeing your lives being transformed in such a positive way, you can’t help but talk to your friends and family. And before you know it, the people you love are loving essential oils too. And they will need someone to enroll under so it might as well be YOU. When we first heard Young Living was an “MLM” we were like … WHAT? Ewe. That’s a “pyramid scheme”, right? We’ll be honest we were a little leery about the sales aspect of Young Living too but we quickly learned those fears were totally and completely unfounded. We love this cute little video that breaks it down with some truthful yet hysterical humor. No worries. There is no scheming going on here. Let us explain. There have indeed been some network marketing companies that have given the structure a bad rap. However traditionally those companies have been profit-focused and not product-focused which is the exact opposite of Young Living’s history. What started as a personal passion for the therapeutic power of nature’s essential oils has grown into a worldwide company devoted the transforming the health and lives of millions. The power of the products has always, and will always, be the highest priority of Young Living. At the end of the day, network marketing is nothing more than recommending something you like. Lucky for us, it is human nature to share things we like. We do it everyday, naturally, in all areas of our lives. It’s easy to be a walking billboard for your favorite restaurant, favorite mobile device, favorite TV series. However the big ‘ole bummer is … nobody is sending checks in the mail for those endorsements. Moreover, when it comes to something that changes your life so profoundly, it is impossible NOT to share that information with your friends. It isn’t about pestering people to the point they avoid you. It is simply about feeling obliged to share knowledge about something that has been so beneficial to your personal life experience. Something we’ve witnessed can effect health and happiness on a large scale in such a positive way. What others choose to do with that new-found knowledge, is up to them! The true test of a legitimate network marketing company is whether most of the products are sold to consumers NOT earning commission or royalties from the company. 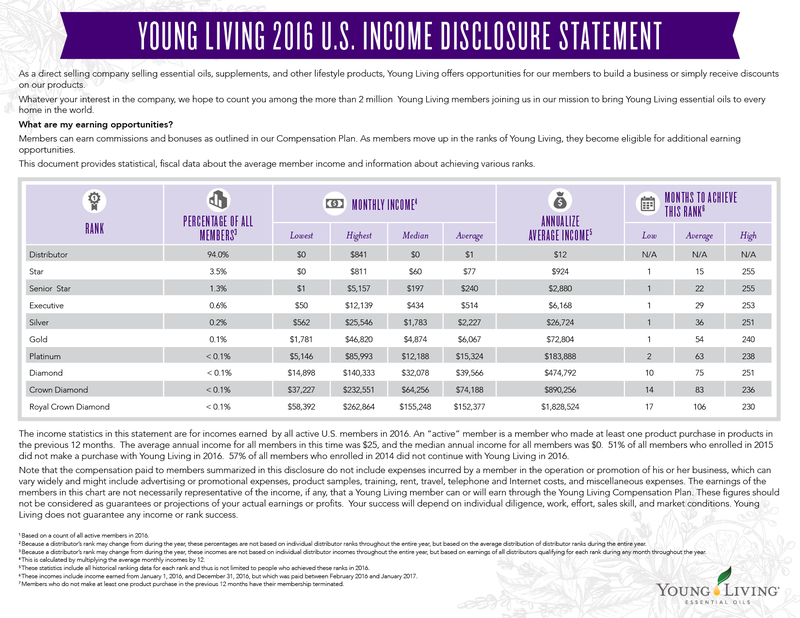 Young Living is a 20 year-old company and as their 2015 Income Statement reveals, 93% of wholesale members simply use the products for themselves and only 7% are actively engaging in the business opportunity. So first and foremost, if sharing isn’t your thing, no worries! There is no pressure, ever. We are simply thrilled that you’ve found us and we are here to help you on your personal oily crunchy journey. However if you are all about pursuing the business opportunity, we are stoked to help. We sure wish we had done it sooner! Oily Crunchy BOOM! will be your first stop. It is our private group exclusive to Oily Crunchy Members who are interested in creating a BOOMing business by sharing their passion for Young Living with whomever will listen. Looking to pay off some debt or save for college or retirement? Maybe you are “meh” about your current job and want to replace your income doing something you love? Do you crave added financial security in case of accident, death or divorce? Perhaps you simply want enough income to pay for your monthly order? Whatever your motivation in growing your Young Living business, Oily Crunchy BOOM! is here to help you succeed. Since deciding to build our own Young Living businesses, we have found it SO REWARDING to work with products we believe in and consistently see lives transformed. The payoff is profound. Not only do we have the privilege of helping people enhance their lifestyles and overall health, but we also get PAID for doing something we love! And that ladies and gents, is really fantastically cool.